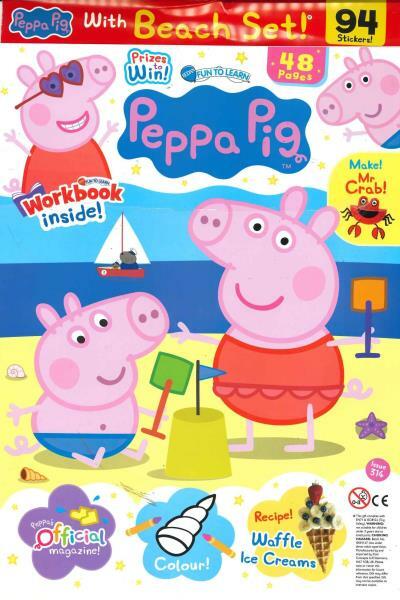 Fun To Learn Peppa Pig is a highly interactive magazine for girls and boys aged 3 - 7. It is packed with stories, activities and puzzles based on the popular TV show, Peppa Pig. Buy a single copy or subscription to Fun to Learn - Peppa Pig magazine. Supporting the National Curriculum's Early Learning Goals, Peppa Pig magazine emphasises learning through fun and entertainment. Each issue also comes with a fantastic pull-out workbook, "sticker fun" sheet and super free gift. Great for young children as they start to learn numbers and vocabulary!! A must buy for Peppa fans . My granddaughter has really enjoyed all the activities in the magazine and it has helped her build skills. She has had the magazine since her 3rd birthday and she is almost 4 years old now. My granddaughter has had great fun with this magazine and always looks forward to getting a new one. My Granddaughter loves the day her Peppa Pig magazine arrives through the letterbox. These keep a bright 31/2yr od going - lots of things to do. My 2.5yr old really enjoys this magazine and loves opening it every 2 weeks. We like the gift from the magazine as my children are always so looking forward to what is the topic related to that gift. Good , we love it! It is awesome. My daughter loves it. For my little great niece - she ADORES it!!! The magazine is good and I like the toys and the stickers the most. My 2/1/2grandaughtee loves receiving her magazine and very enjoys making the projects . She regularly checks the post to see if it has arrived. My 4.5 years old twins love the magazine - its design, the story, the games, the crafts & the gifts. We've realy enjoyed it together. A real fun-to-learn magazine with their fav character for my 4.5 years twins, who learn English as a second language. The attached surprises are great too. The magazine was well received and a good gift idea. my daughter who is 2 years old loves this magazine. the free gift is particularly special (important). There's a lot of variety. It's fun and interesting. Great, my son loves it! My Godchild loves this magazine, full of fun things to do and she loves getting the free gifts. My granddaughter loves everything about Peppa Pig. My grandaughter particularly liked the activities. A brilliant magazine. My daughter really loved it. I bought this for my son who loves peppa pig. The great thing here is the subscription isn't very long, which is ideal when his favorite programme or character changes frequently.